Dr. Wallace’s research program is directed towards understanding how cell number and fate are regulated in the developing brain. Using the retina as a model of brain development, Dr. Wallace has been investigating the function of cell extrinsic factors, in particular Wnts and Hedgehog proteins, in these processes. Her lab has identified essential roles for Wnt signaling in early eye patterning and Sonic hedgehog in neural progenitor proliferation and self-renewal. 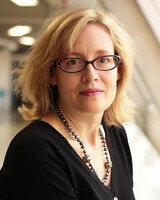 Ongoing research in her lab includes the identification and functional characterization of Wnt and Hedgehog target genes in retinal progenitors, elucidation of the mechanisms of Hedgehog movement and trafficking in neurons, and the development of in vitro strategies to promote retinal stem cell growth and differentiation for cell transplantation to the retina.